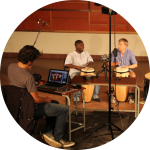 The international work of the Global Music Academy focusses on the preservation, promotion and documentation of musical practice in the world as a contribution to the development of immaterial musical cultural heritage. This includes the development of international cooperation in musical and artistic exchange as a contribution to intercultural understanding and the promotion and preservation of human cultural diversity. To fulfill these aims, the Global Music International program has focussed on developing an international network of partner institutions which share these aims since 2009. The development of innovative training programs in co-operation with institutions in partner countries. In the longer term the vision is to create a unique international network of music institutions dedicated to the preservation and promotion of cultural diversity who are able to exchange students, teachers and teaching materials as well as develop international artistic exchanges. The international program promoted by Global Music International has been supported by many international organizations over the last 9 years. These include the German Foreign Office, the Goethe-Institut, the European Union, the Siemens Foundation, the Norwegian Foreign Ministry, Africalia, Music Crossroads International and the Sri Lankan Ministry of Education. Researching and documenting musical traditions is an essential part of the work of the International program. 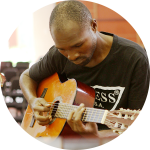 In all the countries we currently co-operate with in Africa there are many musical cultures which have not been properly documented by musicians for musicians. The core idea behind the research and documentation program is to work with our partners to develop a systematic documentation methodology which will allow them to capture these traditions accurately on film. While it is important to understand the history of the music in question and interview the guardians of culture the documentation also focusses intensively on the musical structures and techniques and seeks to capture individual instrumental and vocal parts and how they fit into the overall musical form. The research and documentation provides the source material for development of new curricula. Over the last eight years, the Global Music International program has developed substantial expertise in developing innovative new curricula for western and non-western music forms. 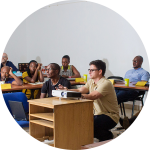 Since 2009 it has been running a curriculum development and teacher training program in East and Southern Africa with partner institutions in 10 different countries. The curriculum used in this program has been developed from scratch using modern teaching methodologies. 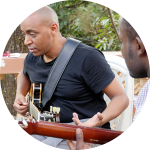 The curriculum is divided into two broad areas, a core curriculum which imparts core musical skills to empower the trainees to develop their own content and more specific content which looks at different musical styles and genres which are normally specific to a particular country or region. For the second area the research and documentation of music cultures are essential. 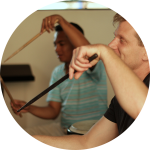 Since 2009 the Global Music Academy has developed a unique teacher training, curriculum development and documentation program called the Global Music Campus. 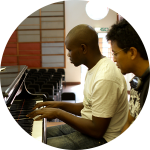 The Global Music Campus gathers musicians from different countries together to develop new curriculum and professional music programs. Currently there are two Campuses running annually in South East and East Africa involving Mozambique, Malawi, Zimbabwe, Tanzania, Kenya, Uganda, Ethiopia, South Sudan and Sierra Leone. In each of these countries there is a partner institution which benefits from the program through teacher training, curriculum development and organizational development. To date the program has completed the development of an innovative 2 year professional training program based on the European Credit Transfer System (ECTS) incorporating credit points, modules, module descriptions and learning outcomes. The partner institutions are also being assisted to gain formal accreditation in their countries. While the program makes use of the ECTS as an international norm the contents of the program are based entirely on musical practice of the region. The first stage of the program involved the development of a core curriculum imparting core musical skills using modern teaching tools designed specifically for the context of the region in close co-operation with the partner institutions. In the second stage of the program the partner institutions are being empowered to document and develop new curricula based on their own musical traditions. In 2017 the Global Music Campus idea will expand into South Asia with partner institutions in Sri Lanka and Pakistan. The pilot phase of the program will take place in Sri Lanka in August 2017. Here the focus will be on South Asian music traditions. 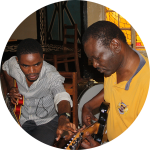 The Global Music Campus started off in 2012 with an intensive workshop format varying from 15 to 23 days in length combining curriculum development with teacher training including coaching by experts and guardians of culture culminating in a final public performance by the participants. Since 2015 several additional formats have been developed. Regular weekly training between the main campuses in the form of peer teaching between the teacher trainees in all aspects of the curriculum. 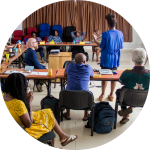 These workshops are held in partner countries using a 5 day format to promote and publicize the program and identify potential trainers for the future. Training in IT skills, content management, music school administration, financial administration, evaluation, accreditation, networking and developing a sustainable social enterprise for directors and administrators. 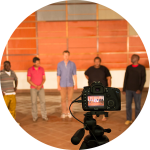 Intensive workshops to teach the trainee teachers how to capture and document their music traditions using audio and video and develop new curriculum using the audio-visual materials. 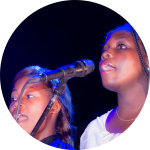 The international network is made up of a number of different partner organizations with a diverse range of approaches to arts and music education in particular but also culture and development. Having collaborated closely over the past 6 years they have jointly developed a common methodology. The curriculum developed for the Campus program is concept orientated, we show the trainees a concept and how to use it to teach themselves and then teach others. This is a learner centered approach which seeks to empower the learners to make choices and enjoy the process of learning rather than memorizing cognitive content for examinations. It encourages them to interpret the syllabus to achieve the prescribed learning outcomes using a variety of methods and resources. In so doing they are stimulated to analyze conceptually and challenged to find new ways to understand and explain a concept. All the modules use practical training techniques to transmit these concepts meaningfully even if they involve abstract ideas. 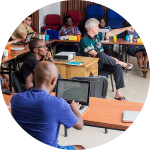 Part of the Campus methodology is to get participants to work with each other: those who understand a concept quicker end up sharing their experience and co-teaching the others in an open learning environment during the Campus. Early on in the process the partners developed a monitored ongoing peer teacher training program which runs between the Campuses. Creating an open learning environment is an important part of the process. Participants are encouraged to interact with the learning materials and make suggestions for improving them. During the Campus the participants are given a strict daily timetable and are required to hand in assignments on a daily basis to monitor their progress. The participants are given a personal assessment at the end of the training. Because of the wide variety of backgrounds of the participants, attention is given to mutual understanding and respect for each other, participants learn to perform music from the other participating countries as part of this process.